While flipping activity overall is down considerably from its peak reached 11 years ago, the median gross profit per flipped property is up considerably and some markets in the country are providing ample opportunities for flippers, according to data released by CoreLogic on Tuesday. According to CoreLogic’s May 2016 MarketPulse, Principal Economist Bin He examined the levels of flipping nationwide and confirmed that the ratio of flipped homes among all residential homes was 4.4 percent for Q1 2016, down from its peak value of 6.4 percent in Q1 2005. But due to much lower overall home sales figures in 2016 than in 2005, the actual number of flips in Q1 2016 was more than 70 percent lower than its peak reached in Q2 2005. The median gross profit per flipped property in Q1 2016 is about 17 percent higher than its peak value reached in Q3 2005 ($56,000 compared to $48,000), although the median percentage gross profit is declined from its peak of 47.7 percent in 2009 down to 41.1 percent in Q1 2016. According to He, the decline in median percentage gross profit is likely due to a significant and steady decline in the overall share of distressed inventory; CoreLogic reported that as of February 2016, the distressed sales share was slightly higher than 11 percent, which is approximately one-third of its peak reached in 2009. 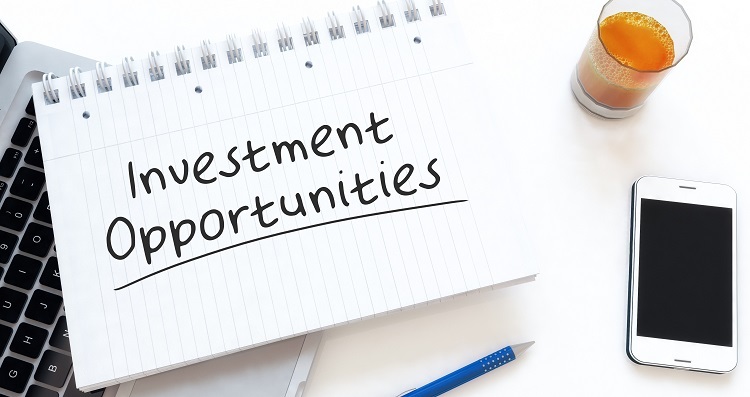 Florida was the state with the most flipping opportunities during Q1, according to CoreLogic. Out of the top 20 core-based statistical areas in the country ranked according to the highest share of flipped homes, eight of them were located in Florida. Seven of the top 10 markets with the highest share of flipped homes were in Florida. The three markets with the highest flip percentage in Q1 were Memphis, Tennessee (8.80 percent); Fresno, California (8.43 percent); and Lakeland-Winter Haven, Florida (7.54 percent). In the top market for flipping, Memphis, the average number of days to flip (111) was well below the national average of 154 days and the median percent gross profit (55.6 percent) was much higher than the national average of 41.1 percent for Q1. The median gross profit in Memphis during Q1 ($38,466), however, was way down off the national average ($56,000). 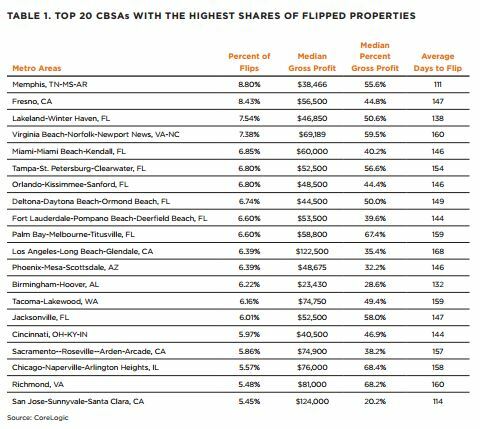 Four of the top 20 CBSAs with the highest flipping percentage were located in California, including the two markets with the highest median gross profit for Q1 (San Jose, with $124,000 and Los Angeles, with $122,400). At the same time, however, those two markets had comparatively low median percentage gross profits (Los Angeles with 35.4 percent and San Jose with 20.2 percent). The markets out of the top 20 with the highest median gross percentage profits were Chicago (68.4 percent, with a median gross profit of $76,000), Richmond (68.2 percent, median gross profit of $81,000), and Palm Pay, Florida (67.4 percent, median gross profit of $58,800).